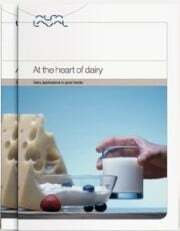 Milk reception and storage: Demand uptime and efficiency. That means components with high reliability, easy serviceability, and both operational and energy efficiency. Mixing and blending: Precise and uniform mixing and blending is essential in many applications, contributing to an effective process and a high-quality end product. Pasteurization: Demands high levels of safety, hygiene, and process control. Fermentation: Getting the most from raw materials is essential in production of cultured products and fresh and cured cheeses. Separation and concentration: Reducing waste and emissions is an essential aspect of concentration processes. Cleaning-in-Place: Quality in Cleaning-In-Place (CIP) is essential in the dairy industry.